Forget about goals. Instead, focus on habits. This is a common refrain of late. The likes of James Clear, Shawn Blanc, and Nir Eyal all make the case for habits being greater than goals. I won’t go so far as to tell someone to not set goals. But I do agree that habits are what will enable you to meet your goals. I still like to set an end destination in mind, but I’ve finally begun to see how powerful — and vital — the habits and routine are for getting to the finish line. Keeping a pretty regular rhythm to my weeks is something I’ve done for some time (as regular readers have likely noticed — I talk about this stuff a lot). So all of that to say the biggest key for me seeing progress was one thing: running regularly. 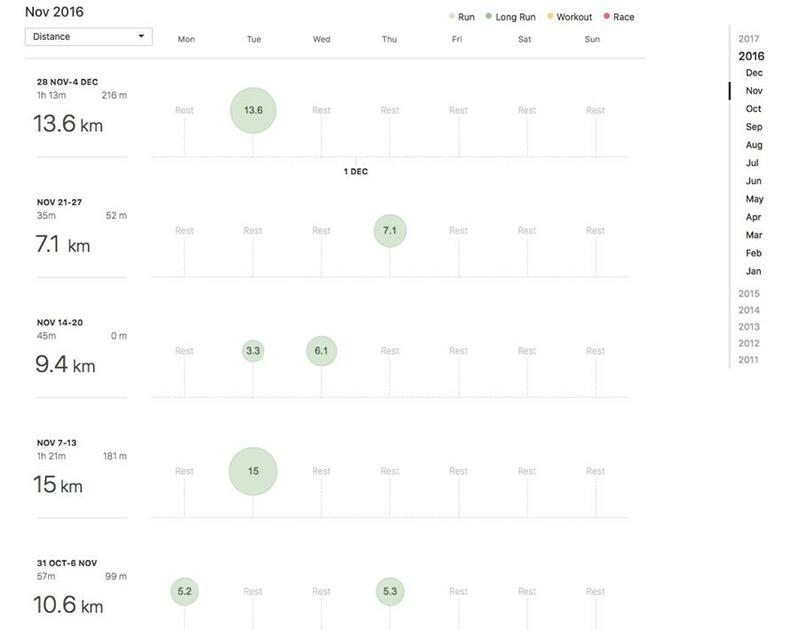 Putting in a plan to incrementally increase how often or how far I was running has made a significant difference. In November 2016, I ran to my church and back for the first time. A distance of 14 KM. It was a big jump in my distance at that time and was a significant milestone. 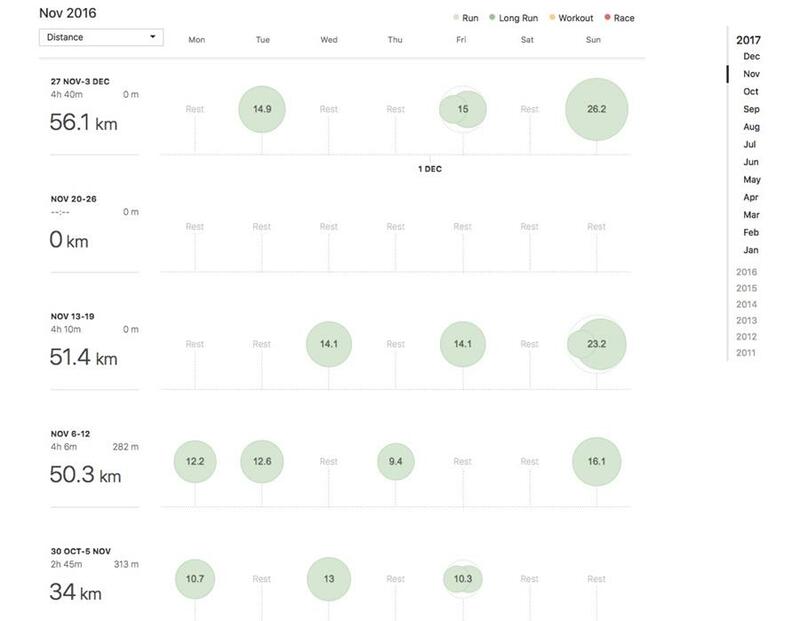 In November 2017, my average runs are 15 KM and quite comfortable. And all because I’ve been running 3 times per week. So as we get ready for the end of this year and the start of the next, I wanted to share a number of articles I’ve enjoyed the past 12 months. They’re all focused on the themes of habits and rhythms and how to ensure you actually accomplish the things that are important to you. This focus for me was triggered last week by this article. To be honest, I’m not crazy about the writing and the post is not incredibly insightful compared to other authors. But the section titled “The power of daily habits” got me thinking about the topic again. Also note that by the end of the article, he admits that he sets goals now. And that’s fine. But when you realize that daily (or weekly) actions are what will actually help you get where you want to go, there also needs to be a recognition that you need to be selective. You only have so much time to fit new habits in your day (unless you have a lot of time you're currently wasting). And itâ€™s not wise to try to build multiple new habits at the same time. So if you want to write a book in 2018, writing daily is all the change you can likely handle. I mentioned James Clear in the opening of this newsletter. He’s been a very consistent voice on this topic. This post is a bit of a summary of his writing on this topic and includes a lot of links. But I also wanted to share a few of his articles I’ve read or had sitting in Instapaper from the last 12–18 months. You’ll see a similarity between these posts, but that’s a good thing. James is consistent with his message. This could be a useful tool when it comes to choosing what habits you want to establish. Or, which ones you need to cut out. While doing is what we’re talking about here when it comes to habits, it’s vital to remember to take time to reflect. That’s exactly what makes this time of year so enjoyable for me. Jocelyn K. Glei puts it well in this article. In order to stop doing busywork and start doing our best work, we have to make a point of scheduling in regular time for reflection. There is a delicate balance to be found between planning and doing, between process and outcomes. But to just simply do all the time without ever reflecting on why or how is foolishness. When you begin to consider the idea of focusing on habits over goals and projects, it’s hard not to move to discussing your calendar as well. I’ve talked about this a good bit over the last year (thanks to proponents of the idea like CJ Chilvers, but it just makes sense with this approach to achieving your goals. Habits work best in a regular rhythm to your days & weeks. This is why Matt Perman includes two full chapters on setting up your weeks in What’s Best Next (titled Setting Up Your Week and Creating the Right Routines). Cal Newport and the folks interviewed in this article above are also proponents of making your calendar the place where you put your focus. My hope is this post and the content it points to will be helpful for you as you reflect. I know I’m going to enjoy the week between Christmas and New Year’s Day just resting mentally and envisioning the year to come. I hope you get a chance to do the same! And let me close with this reminder: this is not just about your career! It’s so easy to read about focus and achieving goals and success and then apply that to our work life. But anyone who takes these ideas and applies them 100% to their career will likely end up feeling empty in the long run … even if they find success. We’re more than our jobs. Let’s remember that as we plan for 2018. Your family, friends, coworkers, and physical & mental health all need as much (or more) attention as your profession.